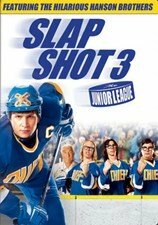 The Hanson brothers return for this second sequel to the rowdy sports comedy classic, this time coming to the aid of the young children residing in Newman House, an orphanage targeted for demolition by an unscrupulous condo developer. The siblings come on board as sponsors for the children, teaching everyone valuable lessons about both hockey and life. Steve Carlson, Jeff Carlson, David Hanson, and Leslie Nielsen star. 91 min. Widescreen (Enhanced); Soundtrack: English Dolby Digital 5.1; Subtitles: English (SDH), French, Spanish; deleted scenes; "making of" featurette. The Charlestown Chiefs are a minor league hockey team going nowhere in the standings and with the fans, until a trio of psychotic brothers joins them and transforms them into the Wild Bunch on ice. Paul Newman and Michael Ontkean star in this ribald and uproarious film. 123 min. Widescreen (Enhanced); Soundtracks: English Dolby Digital mono, French Dolby Digital mono, Spanish Dolby Digital mono; audio commentary by the Hanson brothers; interviews; biographies; theatrical trailer. Twenty-five years after the Hanson brothers left the hockey world in stitches, the raucous siblings are back. The terrible trio is called on to help the Charlestown Chiefs, who have moved to Omaha and have been turned into the Washington Generals of their new league, buffoons for Harlem Globetrotters-styled hockey antics. Can the Hansons instill an "old time hockey" feeling into the team? Stephen Baldwin, Gary Busey, Jessica Steen, Jeff Carlson, Steve Carlson, and David Hanson star. 104 min. Widescreen (Enhanced); Soundtracks: English Dolby Digital 5.1, DTS 5.1, French Dolby Digital 5.1; Subtitles: Spanish; biographies; "making of" documentary; interviews. NOTE: This Title Is Out Of Print; Limit One Per Customer.